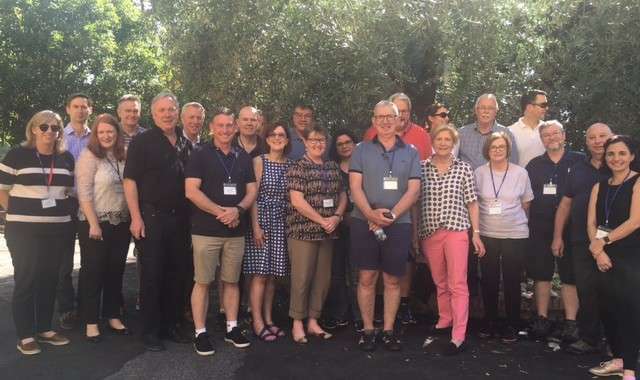 Seventeen representatives from the Australian Catholic Education sector travelled to Rome to participate in Australian Catholic University’s Education Executive Symposium 2018 across Sunday 9th September to Wednesday 12th September. The Symposium was opened by Professor Greg Craven, Vice-Chancellor of ACU, on the Sunday evening at a Welcome Reception. The programme across subsequent days included keynote speakers from Rome, Scotland and the US, group discussion and dialogue with members of various Vatican education departments. Cardinal Giuseppe Versaldi’s talk, titled ‘Educating to Fraternal Humanism: Building a Civilisation of Love’, sparked debate about the future of the Church and Catholic education. The Cardinal was followed by a speaker from the United States, Dr Timothy McNiff, the School Superintendent for the Archdiocese of New York. His presentation brought a reality to the symposium around the difficulties facing the church, with his direct numerous school closures, no government funding and the challenge of fundraising to keep schools open and relevant in a changing world. Mrs Barbara Coupar, Director of the Scottish Catholic Education Service, presented a different challenge where all the schools are operated by the government and her role is ensuring an authentic Catholic education in an intercultural and multi religious community. Each speaker brought a unique perspective to the Australian audience of the rapidly changing and challenging environment facing the Catholic Church and education systems. This sparked debate, ideas and new possibilities for education in Australia. As with any Australian gathering, the camaraderie, socialising, meeting up with old friends and making new friends was a highlight. An added bonus was catching up with Ms Judith Potter, Principal of Loreto Ballarat, Ms Sharon O’Keeffe, former Director of Mission, Loreto Kirribilli and Professor Elizabeth Labone, Director on the Loreto Normanhurst Board, who was also part of the organising committee for the Symposium.